We are moving at warp speed into the digitized world, where data has reigned king for several years. With the Internet of Things (IoT) becoming more prominent in our daily lives, data will become more powerful now than ever. As per the estimates, the total amount of data created by any device will reach 847ZB annually by 2021 (Source: Cisco). Much of this data will be left unanalyzed and remain unused. So, what should the businesses do with this huge volume of data? Monetizing of IoT data is the next evolution in the growing connected economy. As the data continues to grow exponentially, it will enable the IoT players to sell & exchange their data. In other terms, a concept where enterprises change their business model from Sell and Forget to Connect and Improve. An open ecosystem where device manufacturers and service providers can directly generate revenue from the interactions of devices & service. 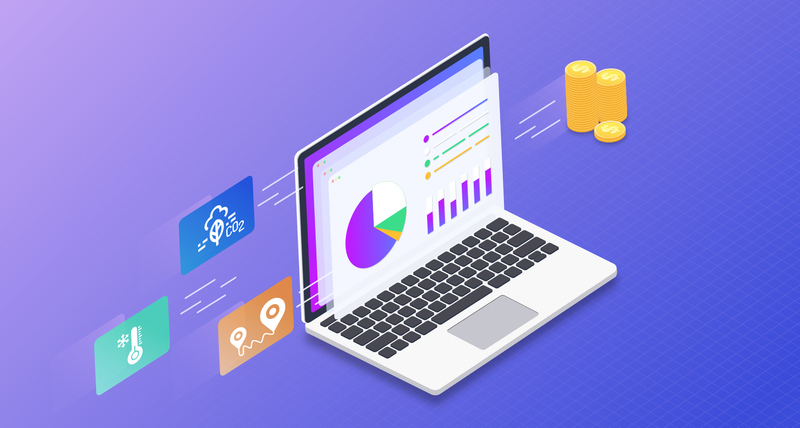 Let’s have a look at a few examples which will precisely explain how this monetizing of data can work for different business. Scenario 1: Smart parking service providers can help the user’s to find and track the empty parking space available at the user’s destination. Real-time location data from these service providers can be used by the nearby restaurants to provide exclusive offers as advertisements to the users. For example, When Harry enters his destination in the smart parking app, he is instantly notified about the available parking space at his destination. As he is about to reach the destination, he receives an advertisement offer from the nearby local restaurant and decides to reserve a table. Though being a parking service provider, this company will now be able to monetize their data with context-sensitive advertising. Scenario 2: A smart factory has a gamut of assets (from different manufacturers) fitted with sensors collecting real-time data on asset performance. Different asset manufacturers can use the collected performance data to schedule their maintenance activities. These are few of the many examples where IoT data opens up new streams of revenue for business if utilized in an efficient manner. There is no one size fits all way to monetize the different types of IoT data i.e. location, living, environmental etc., that is being generated by all the physical entities. To leverage the potential of the data, businesses are expected to extract additional value from their data usage to increase their revenues, reduce the costs, and transform their productivity & customer services. Tonnes of Data – Asset or Junk? Monetizing strategy determines the outcome! Businesses have to start thinking of data as a valuable asset and consider IoT data as a profit center. The concept of data monetization is still in its early adoption phase and most organizations are poorly equipped in terms of knowledge & experience to capitalize the information. Challenges such as security concerns, lack of standards, significant investment without a clear ROI, data ownership, etc. hinder the adoption of different business models that can help monetize the data. In the connected data economy, businesses are required to continuously find new ways to keep monetizing IoT data. There will be consolidation within the data economy, expansion of ecosystems, and customer-centric business models. As the saying goes, ‘It is easier said than done’, research estimates that ~70% of the businesses are not monetizing their IoT data (Source: Capgemini Consulting analysis). However, in the middle of difficulty, lies opportunity and it is time for the organizations to act now by connecting the dots and utilizing the data. Organizations that spell out a clear vision for IoT data monetization, can efficiently pave their path through these challenges and achieve a competitive advantage over their peers.